Our house is filled with books for every member of the family. I've switched almost entirely over to e-books for myself, but Fred and Amber still enjoy physical books even though they will read an e-book. It's really not a matter of preference for me, but a matter of storage. I don't want to store hundreds of my books and I don't want to necessarily give up my books either. The e-books were the perfect solution for me. Amber uses e-books daily, but still prefers a physical book when she has the chance. Recently, we've even spent more time in actual book stores so Amber can browse the teen fantasy sections. There is still something about the smell of the books and feeling the covers which she especially enjoys. Thankfully Amber found new books to enjoy and so we now have an addendum to her list of recommended middle school fantasy reading books I posted earlier this year. 1. Much to Amber's delight, John Flanagan has written a prequel to the Ranger's Apprentice series called Ranger's Apprentice: The Tournament at Gorlan. She missed this series a great deal and was eager to return to the fantasy world. She was not disappointed. 2. The next recommendation is definitely not for the younger middle school aged children. Actually, I would say probably 8th grade and up is best on this one. This summer Amber found, by browsing at Barnes and Noble, a series by Sarah J. Mass called Throne of Glass. Last week Amber picked up the fourth book in the series (fifth if you count the book of prequel short stories). Amber had difficulty giving me a brief summary of the series, but it revolves around a young woman who is a queen that was forced out of her country when she was a very young child. She was taken in and trained by an assassin, then when grown she returned to take back her kingdom. Instead she found it nearly destroyed and is now attempting to rebuild it. 3. Rick Riordan has always been a favorite of Amber's, and his new series Magnus Chase and the Gods of Asgard are no exception. Amber devoured the first book in the series, The Sword of Summer. She is eagerly awaiting the next book, whenever it might be available. Please, please be soon, for this mother's sake. 4. Amber's final new recommendation is the WaterFire Saga by Jennifer Donnelly. There are currently three books in this series: Deep Blue, Rogue Wave, and Dark Tide. 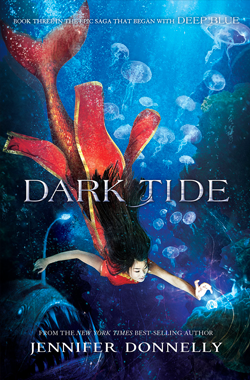 Amber has yet to read Dark Tide, but the other two she actually acquired from the library earlier in the year. I think she might be adding the entire series to her Christmas list. If you have any new middle school / early high school fantasy reading ideas, let us know! It is a full time job keeping our girl in books. I'm thinking there will be a lot of home schoolers doing books for B! This is a great list of books. I shall be checking them out for my guys. Thanks for sharing! Thanks for this! My 7th grade daughter is looking for a new series to start, and Throne of Glass seems perfect for her! Thanks for sharing these books! I hope they will jump start my reluctant reader to read more. She has enjoyed several books by Rick Riordan, so we will start there. I'm learning to love ebooks, especially now that I've figured out how to easily check ebooks out of the library. I remember my older daughter reading a few fantasy books, but I don't think that phase lasted too long. I can't remember any specific books to recommend. I love e-books because I can have a whole library in my back pocket. My boys' favorites are audiobooks - they like to read along as they listen.